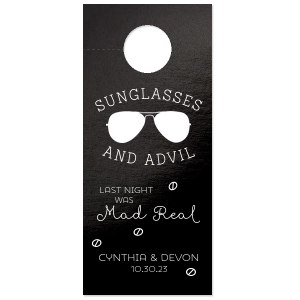 Customize Door Hangers for personalized party favors guests will use! 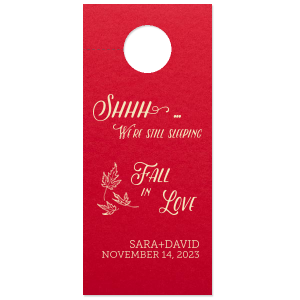 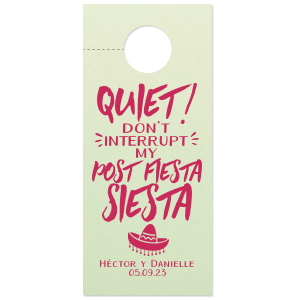 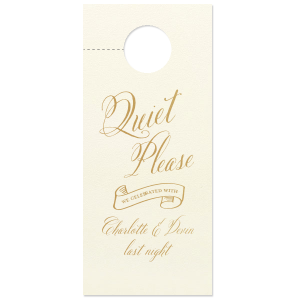 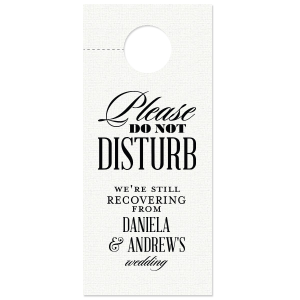 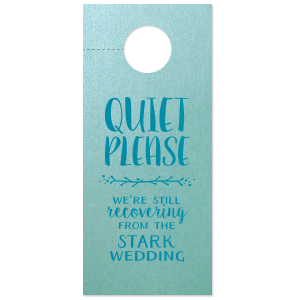 For private moments or to get some extra shut-eye after a fabulous party, personalized Door Hangers are perfect for your bachelor and bachelorette parties, wedding welcome bags, and party favors. You're not the only one who is going to party the night away on your wedding night. Give your guests custom door knob hangers so they can let the whole hotel floor know who brought the house down. 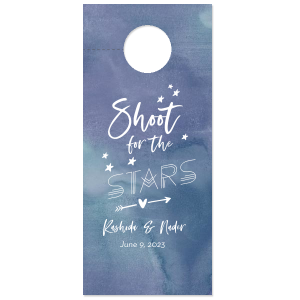 Welcome your guests in style and add a personalized door hanger to each wedding welcome bag to give something fun for your guests to hang on their door. 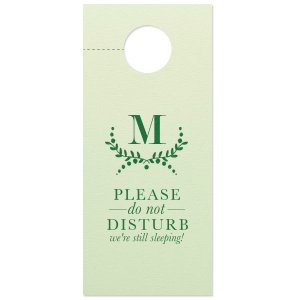 Choose from our fun custom door knob hanger designs that include phrases like “Do Not Disturb,” “Still Dreaming” and “We Went a Little Overboard Last Night…” All you need to do is fill in your personal details to these pre-made designs and you have a custom printed door hanger your guest will delight in. 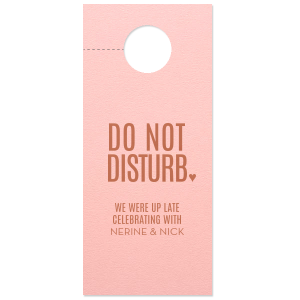 You can also create your own using our product customizer to add your own ingenious details like a fun saying, wedding reception details, a funny wedding pun or even your wedding hashtag. 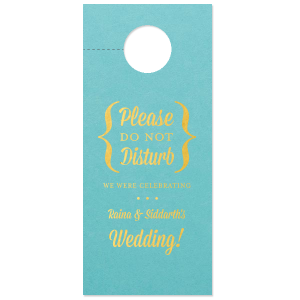 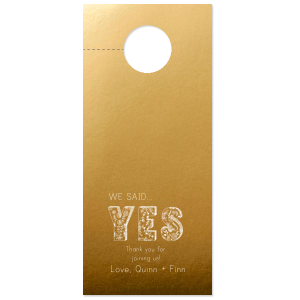 Our extensive paper color options and foil imprint colors let you match your door hanger to any wedding theme. Not shopping for your wedding? 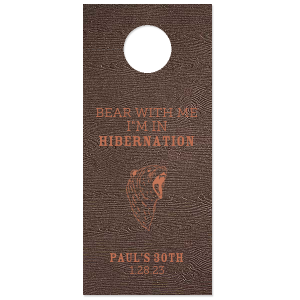 These custom hang tags work on any door! 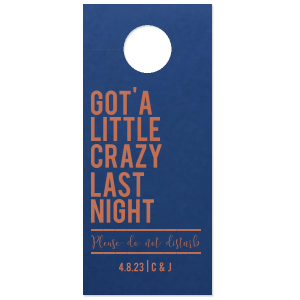 Bachelorette parties, family reunions or lake cabin getaway weekends, create a paper door knob hanger for any scenario where you need some much needed alone time.